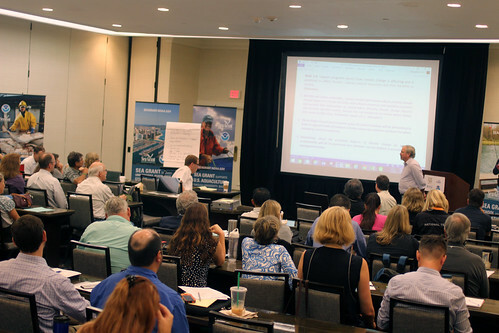 The first step of the planning process was a visioning workshop of the Florida Sea Grant Advisory Council. The process culminated with a two-day workshop in St. Petersburg attended by approximately 80 people. Florida Sea Grant has a long history of providing solutions to problems that affect coastal communities, businesses, residents and resource managers in this complex environment, and we will continue to tackle complex issues over the next four years. We collaborate with partners at local, state, regional and national levels to achieve shared goals, and we leverage our federal funds at a three-to-one ratio with state, local and private funding. We use the research expertise of over 300 coastal and ocean scientists at 18 Florida universities and are hosted by the University of Florida, which is the state of Florida’s flagship research university. Our extension program is seamlessly embedded in the UF Institute of Food and Agricultural Sciences Extension program. Twenty-five Sea Grant-affiliated extension agents live and work in coastal communities and we have extension specialists at UF in economics, environmental law, aquaculture, seafood safety, waterway planning, aquatic health and coastal planning. Florida Sea Grant’s Strategic Plan is a road map that identifies how the organization will address ocean and coastal issues with relevant research, extension and education. The plan identifies goals, outcomes, performance measures and metrics in four focus areas that are aligned with those found in the national strategic plan. The plan is developed with broad input from coastal constituents, extension faculty, esearch faculty, local elected officials, local, state and federal agency staff and the Florida Sea Grant Advisory Council. The first step of the process was a visioning workshop of the Council. Coincident with this event, each of our extension ‘work action groups’ (fisheries, aquaculture, coastal planning, etc.) developed preliminary goals and outcomes in those particular areas.